Seiketsu, or the Standardize phase, is initiated after the workspace has been decluttered, organized, and cleaned. Standardizing procedures will ensure the first three phases are maintained and the facility doesn’t go back to the way it was before 5S. Thispillar utilizes a set of schedules and checklists that can be easily followed so each step of 5S is performed exactly the same way every day. This way, each employee knows what he needs to do, when he needs to do it, and exactly how to do it; there is no room for uncertainty. 1) Make sure each employee knows his responsibilities. If employees don’t know exactly what is expected of them, then how can they do it? They should have a clear understanding of their daily and weekly Sort, Set to Order, and Shine tasks. Their responsibilities should be clearly written out on a checklist or a chart so they can be easily accessed throughout the day. 2) Make it a part of their daily routine. If employees are trained correctly, they will execute the steps of 5S without even thinking about it. "That wrench is out of place. Its home is here." -or- "I know the next tool I need is the screwdriver because my tools are stored in the order that I use them." No extra thought is needed; employees flow through their daily routine because they can see that it makes sense. Once the steps are in place, performance can be evaluated at regular intervals. Evaluations can be completed by a committee made up of employees from different departments or the evaluation can be assigned to department supervisors. Either way, it is important to have a system in place to ensure tasks are consistently getting done. 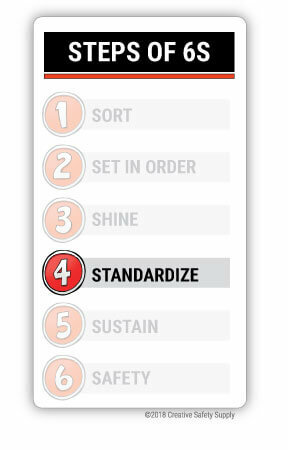 Standardize is an essential step to the success of 5S implementation. 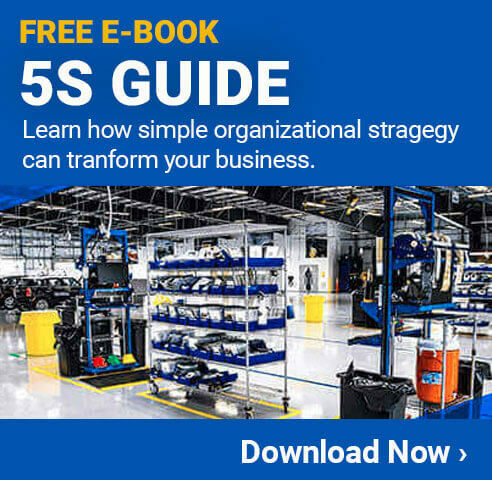 If the staff has procedures to follow to complete the steps, an organization will find long- term success with 5S. And consider adding Safety with 6S.